So I had this grand idea. 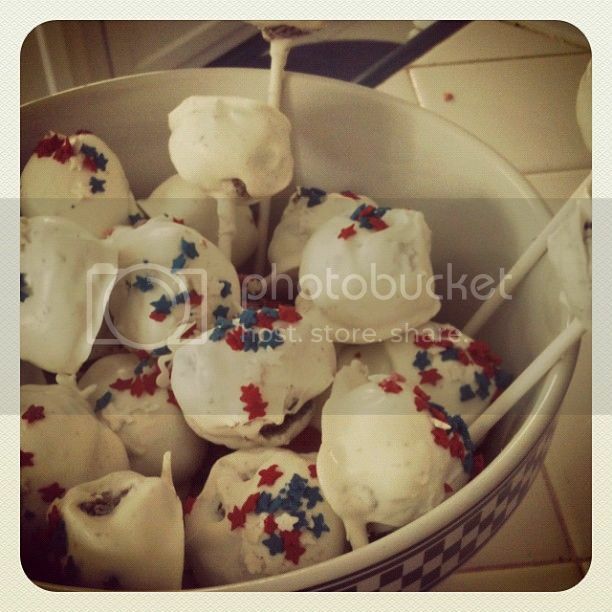 I'd make cute little cake pops for a small 4th of July celebration. They'd be super cute and everyone would love them and life would be great. Then I tried to make them. And it was HARD. Like, I didn't know it would be so hard. They seem like they should be easy. 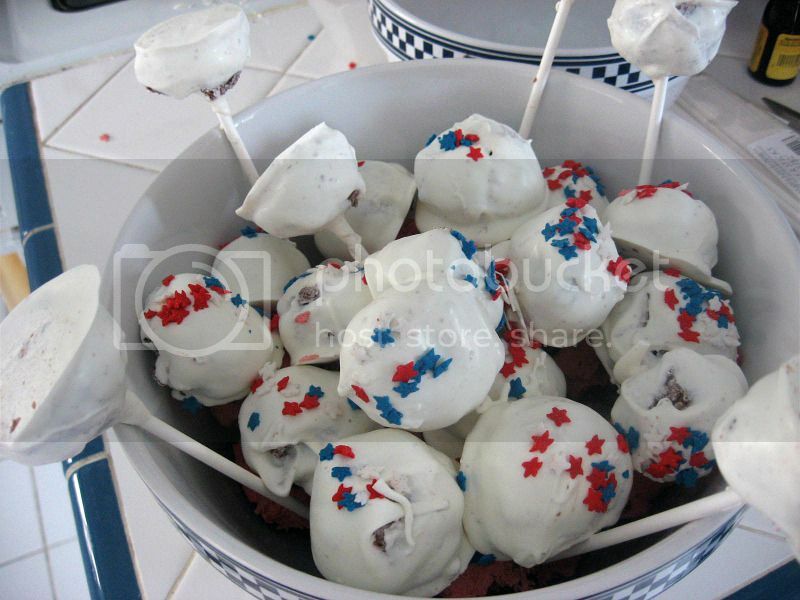 A little cake, a little melted candy coating, a popsicle stick, what could go wrong? The balls could slide down the stick for one thing. They could maybe have too much frosting in them, or maybe the chocolate was not melty enough, or probably I didn't let them cool enough. The point is, I quickly abandoned making pops and switched to just balls. And they aren't pretty like Bakerella's. Hers are so pretty. Granted, she's had a lot of practice. But man, it made me feel pretty dumb. I guess this is one of those learning curve things? But with the amount of hassle I experienced, I'm not sure I'm going to try making them again any time soon. But if you want to try it, please do, and let me know how it goes! 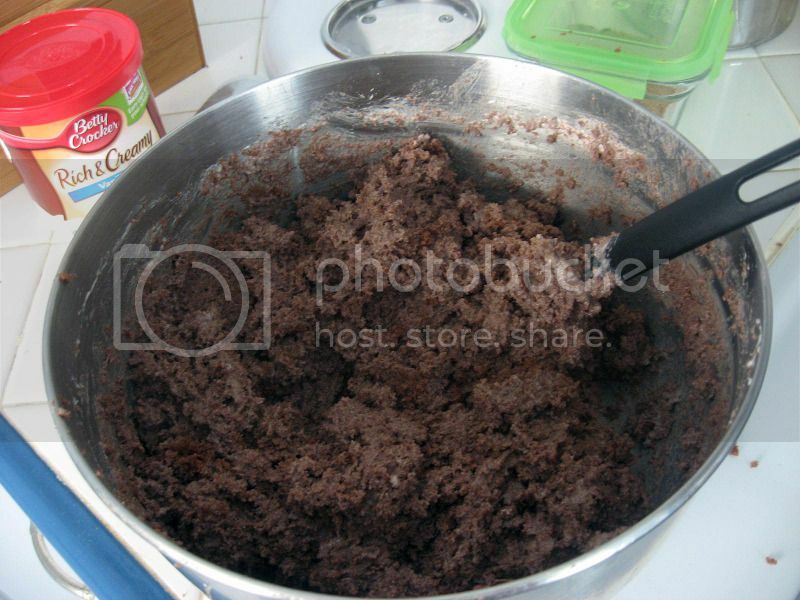 Mix thoroughly with most of the can of frosting. You probably won't need to use the whole thing, you don't want them to be too goopy. 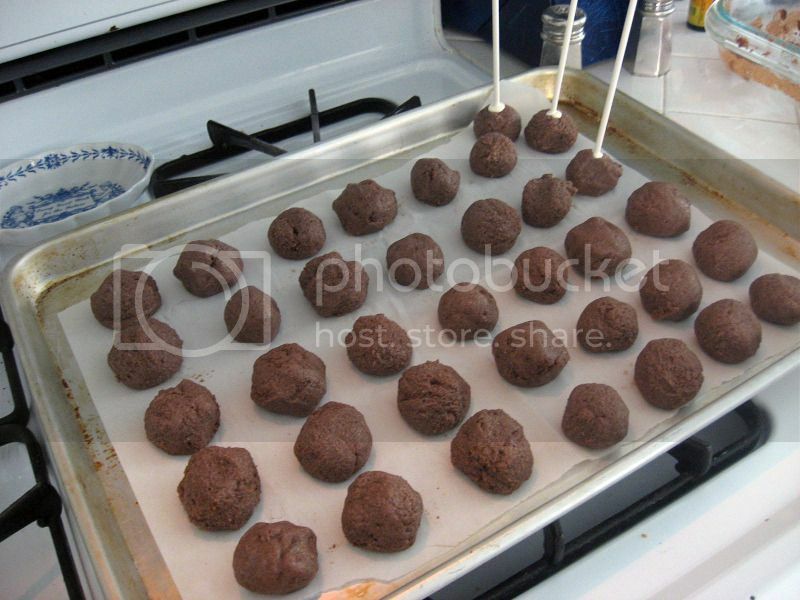 Roll mixture into quarter size balls and lay on a cookie sheet covered in wax paper. Chill for several hours, or put in the freezer for a bit. 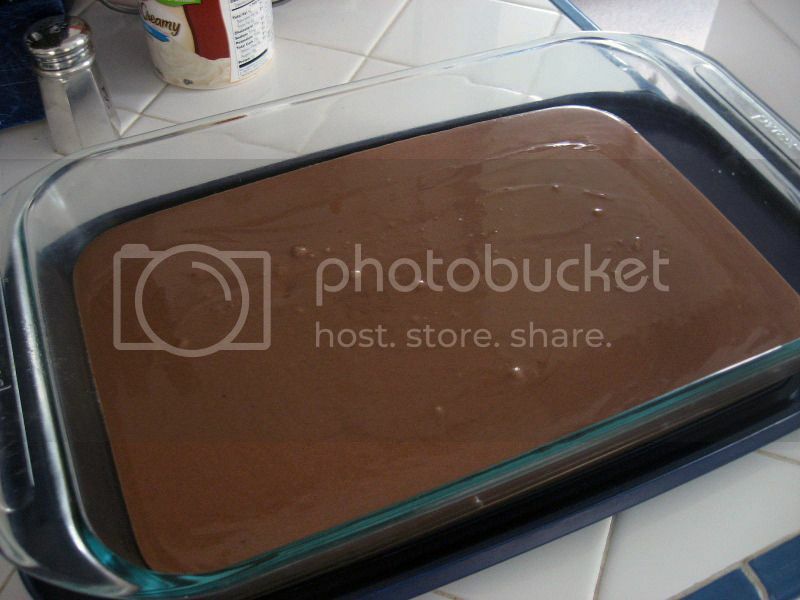 Melt chocolate in the microwave in 30 second increments, stirring in between each zap, until it's all melty. Roll balls in the chocolate and lay back on the wax paper until firm, using a spoon to dip and roll in chocolate, tapping off the extra. Cake mix about to go in the oven. You're going to need eggs, water and vegetable oil for the cake. 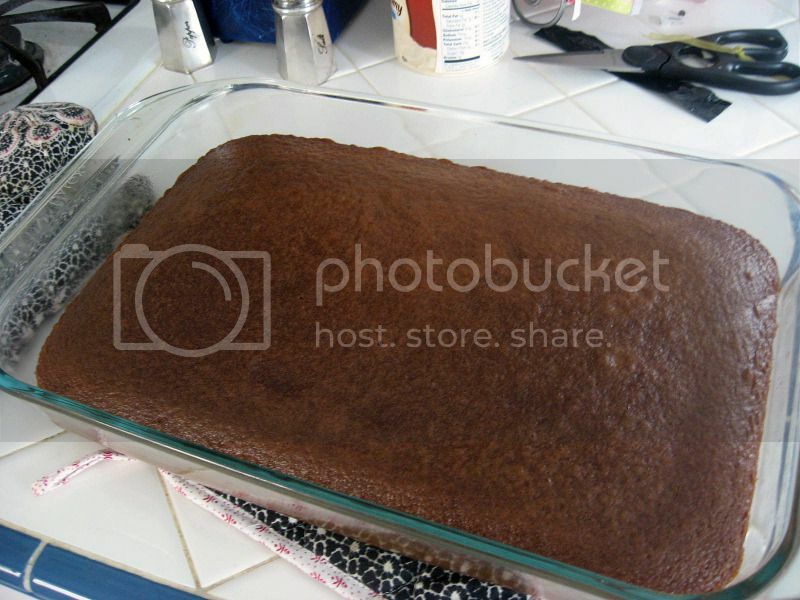 Bake in a 13x9 pan according to box directions, which is probably at 350F for 26-31 minutes. 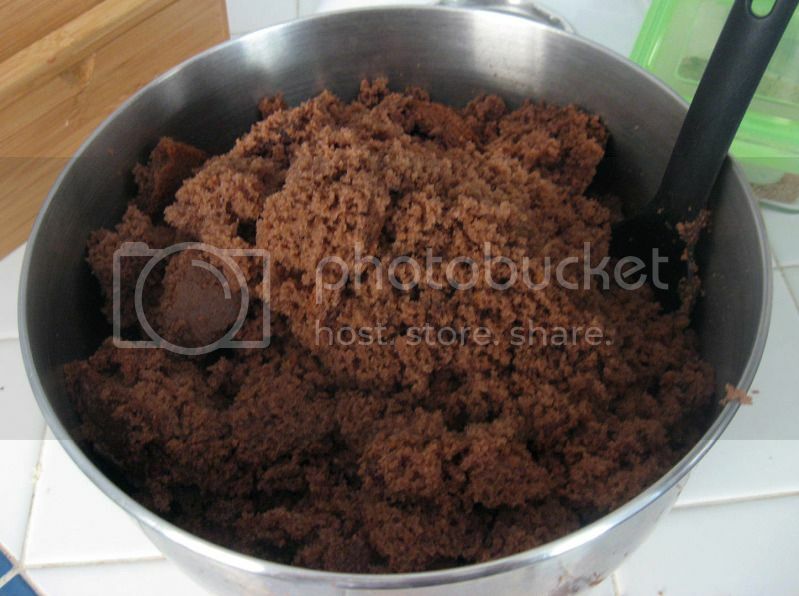 After the cake is cooled, crumble into a large bowl. 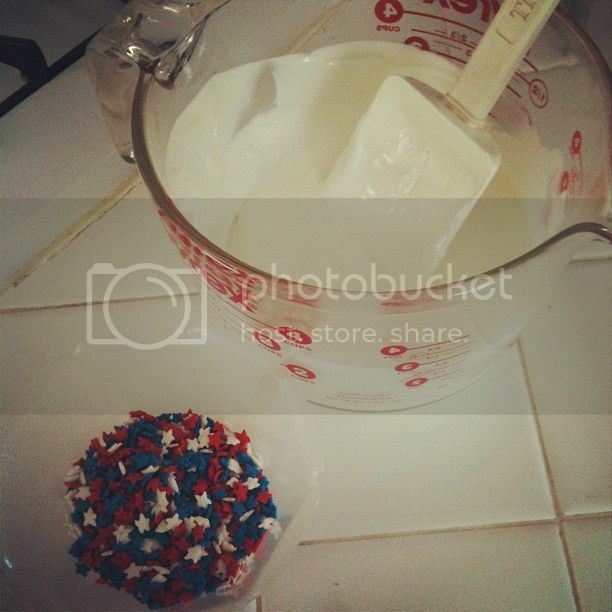 Mix in the frosting. I suspect maybe I used a tiny bit too much, maybe? I don't know! Roll it into balls. 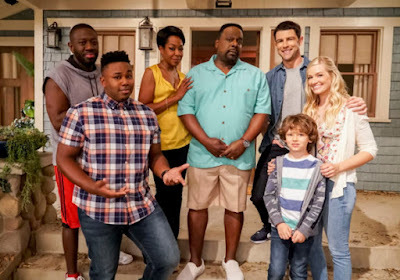 You can see I started to try to make some pops in the corner there. I quickly abandoned that notion! Melt up the candy coating. Get your sprinkles ready if you feel so inclined. I don't have any pictures of the agonizing process of dipping these things. As you can see, I ended up with a few pops, but not many. I also made the colossal mistake of trying to dye some of the melted chocolate with food coloring to make some red ones, which I am telling you right now: DO. NOT. DO. THAT. It will turn the chocolate into a hard, impossible blob. It's something about the water that does it. The good news is, despite my trials and tribulations, they still tasted great. And I suppose that's all that really matters in the end, right?